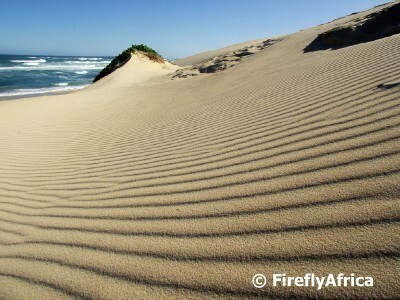 The area from Port Elizabeth eastwards, specially around Grahamstown and Bathurst, is where the British Settlers settled in 1820 (see here and here). On top of Gunfire Hill overlooking Grahamstown is the big Settlers Monument building and just down the road from it visitors will find the British Settlers Family statue. 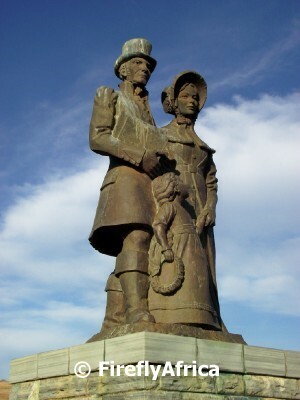 The statue depicts a settler family as they would have looked on their arrival in Algoa Bay. Along with the Xhosa and the Dutch, the British Settlers form part of the rich cultural heritage that the Eastern Cape can boast with. 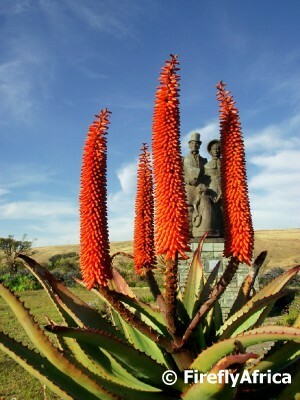 One of the other symbols of the Eastern Cape is the aloe, here photographed in front of the British Settlers Family statue. Driving through the Free State there isn't always very much to see immediately next to the road, so stopping at roadworks doesn't really mean that you can sit back and enjoy the scenery. Or can't you. 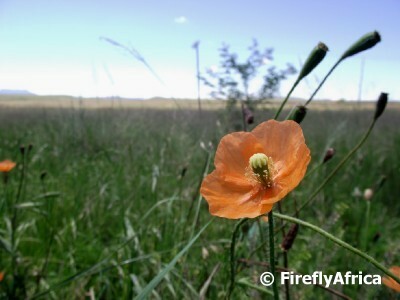 Right next to the road was a strip of greenery with these very interesting little orange flowers blooming in it. There was just time to hop out for a quick picture before the worker swung the stop/go sign around and the lorry behind me hooted. 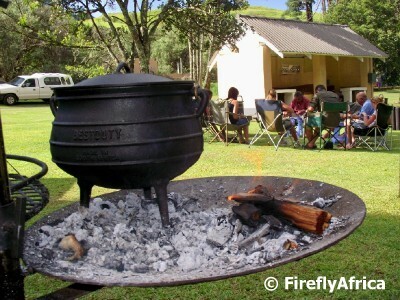 The weekend is upon us and one of the most popular South African weekend pass times is to have a braai (barbecue), or in this case a potjie (stew made in a cast iron pot on the coals). Scratching through the archives I found a post I did with a potjiekos recipy 2 or so years back. Enjoy the weekend everybody. Its amazing what the Zulu women can do with grass and coloured thread. 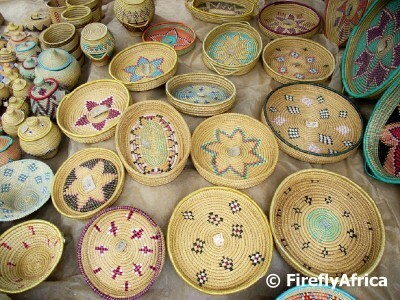 It takes them from several days up to a couple of weeks to produce the bigger baskets and items in the photograph above while one of the plate like baskets (at a loss for a better word for it) will sell for only between R100 and R200 (South African Rand). An absolute bargain and must have memento of the area. 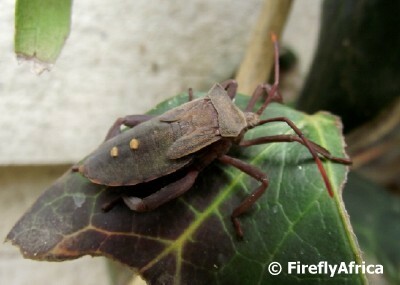 I did a post on Twig Wilter Bugs about 18 months or so ago after finding a number of them in my garden. It seems that they appear seasonally as a little while back I had a whole "invasion" of them on a creeper plant in my back yard. 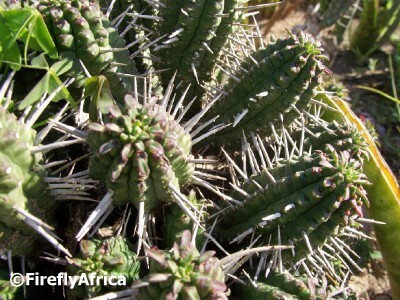 They live off the sap of the plants causing the plants to wilt. Hence the name. Seeing that they produce a foul-smelling secretion as a defence I decided to keep my distance, although they kept on turning around and moving off when I got too close with my camera. Hoy! What you looking at? There are a couple of places along the Garden Route where visitors are able to see what we generally refer to as Dassies. 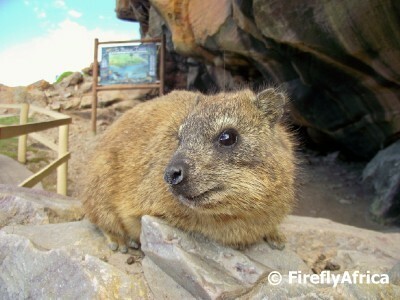 The Rock Hyrax (Procavia capensis), or Cape Hyrax live in habitats with rock crevices in which to escape from predators. They normally live in groups of 10–80 animals and forage as a group. Like with Meerkat (Suricate) there is always one on the lookout for predators, or in this case posing for photographers. 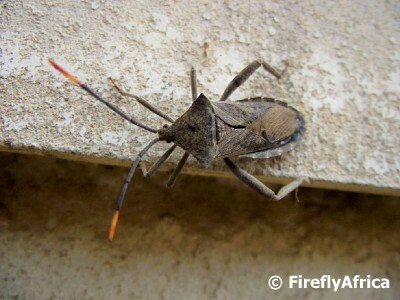 They aren't endangered and unfortunately, in some areas they are seen as a minor pest. 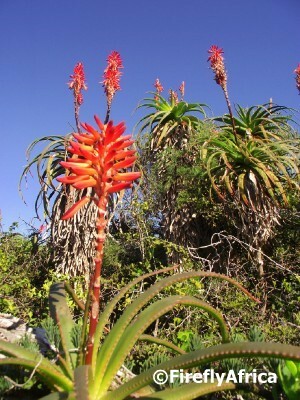 A weekend or two ago I took the family and joined a guided walk along the Aloe Trail in Port Elizabeth. 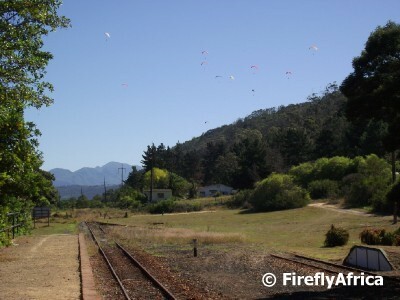 The trail is situated between Bluewater Bay and Amsterdamhoek and consist of 2km as well as 7km trail options. Because we had the Rugrats with us we decided just to do the 2km section which offered fantastic views of the Swartkops River as well as a number of interesting plants and flowers. It isn't hard to see where the nature reserve got its name from. 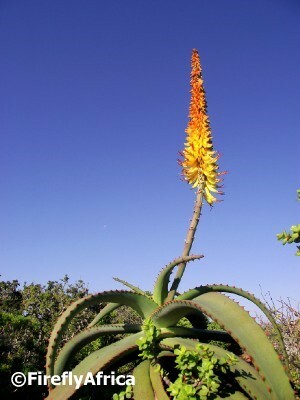 Where ever you look there are aloes with a number of them being in full bloom already and others on the verge of blooming. 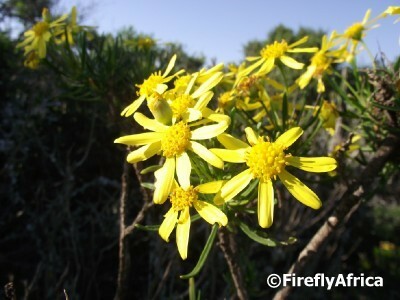 The predominant ones in flower at the moment are these that I know as Fence Aloe, although I may be wrong. But one doesn't have to know its name to appreciate its beauty. This bush had everybody in the group stumped. 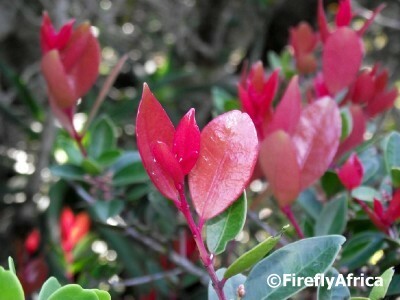 All its new leaves are pink and as time goes on they then turn green. It didn't have any flowers on it, but the pink leaves does make it look like its flowering. 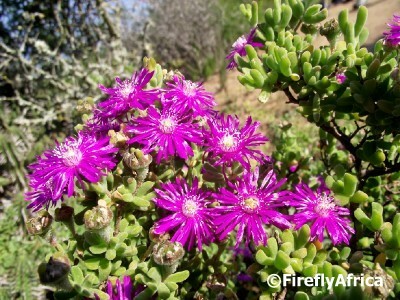 The Vygies are in full bloom with their brilliant purple flowers standing out against the green background. 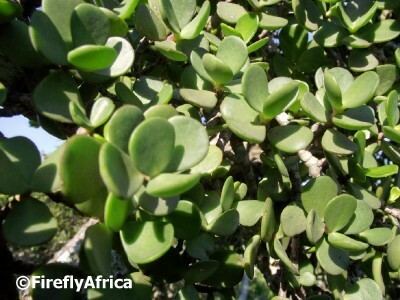 The tree on every body's lips at the moment is the Spekbook (Portulacaria afra). People are encouraged to plant spekbook due to its ability to store big amounts of carbon in its roots. 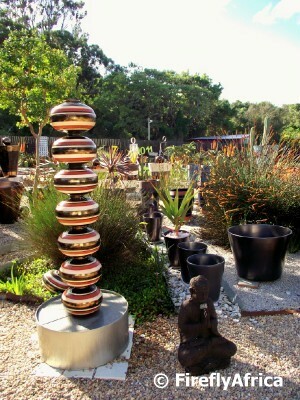 So if you want to decrease your carbon footprint, plant a spekboom. 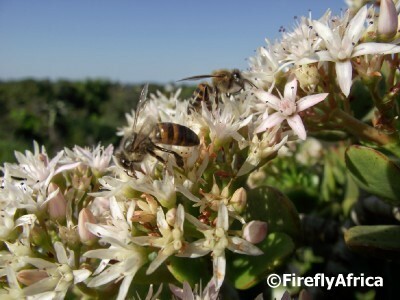 Spekboom usually flower in spring especially after good winter rains of which we have had lots this year. Another type of spekbook is what we call the wide leave spekboom. Again the non-botanist in me tells me I'm probably wrong. 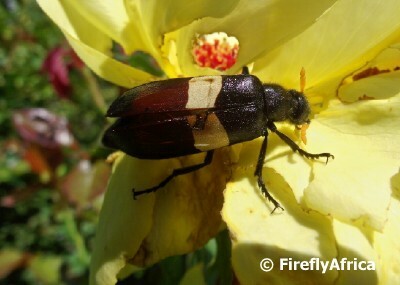 I have a couple of them in my garden which has pink flowers, but these had a white one. I feel like I'm letting the team down today (sorry Helen, Caroline and Diana), but I think these are a type of Daisy. I will correct any of these names if somebody does throw some info about them my way. There isn't much I have to add to the picture. Its not the best closeup, there is too much shadow and the flower is slightly wilting, but if I don't post it today I probably never will. 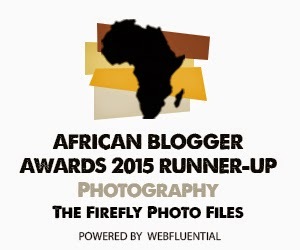 Usually after downloading photos off the camera I sit and edit those I want to load onto my blogs. At the time I um'ed and ah'ed about this one and decided to just edit it for posting, perhaps along with a couple of other bug pics. But its been sitting on my memory stick looking at me every day for 6 months now. So its now or never. 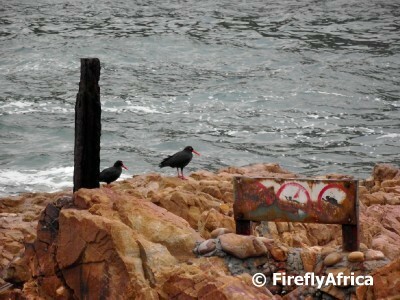 The sign on the rocks at the Knysna Heads says "No Diving", "No Swimming" and "No something else I couldn't make out", so the only ones making use of the rock are the Black Oyster Catchers who would just walk along and pull oysters off the rocks. No diving or swimming necessary. 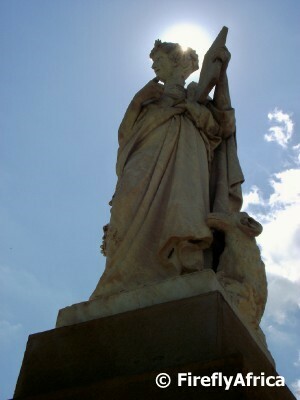 The sun forming a halo on the head of the Dutch Language Monument in the Eastern Cape town of Burgersdorp. Would have been awesome if the statue was an angel, but alas she doesn't have wings. Talk about licking out your plate when you done. 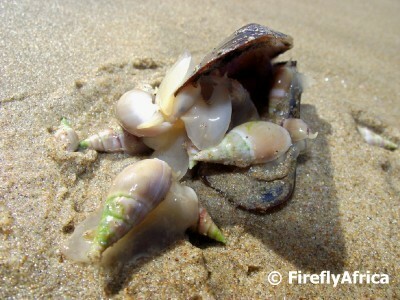 A couple of Plough Shells cleaning out a mussle shell dropped on the beach by a Black Oyster Catcher. Nelson Mandela Day was initiated after the former president's 90th birthday in 2008 and on this day people are urged to give 67 minutes of their time to do something for the community. The 67 minutes represents the 67 years that Madiba spent fighting for the rights of humanity. Yesterday, on his 93rd birthday, various (well, more like quite a lot) initiatives took place around the country to celebrate the day. 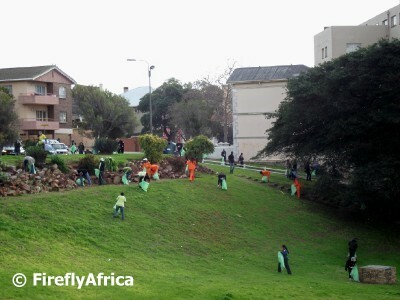 My 67 minutes were spent in an initiative organised by Nelson Mandela Bay Tourism (NMBT) in Port Elizabeth to clean up the area around Fort Frederick on the historic Donkin Heritage Trail. 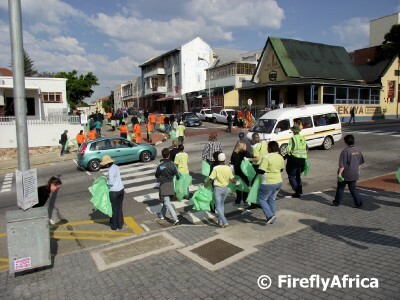 The turnout for the cleanup was surprisingly big with employees of NMBT being joined by the Mayor of Nelson Mandeal Bay, stakeholders and product owners in the tourism industry, the South African Police, various church representatives and many others. 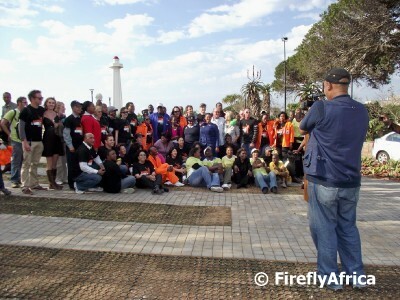 The group gathered on the Donkin Reserve where everybody were supplied with refuge bags and gloves and from here moved towards Fort Frederick cleaning up along the way. 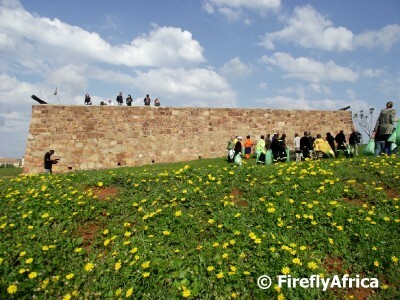 Cleaning up the park surrounding Fort Frederick which was built in 1799 and is the oldest building in the Eastern Cape and the first permanent stone structure built by the British in Africa south of the Equator. The group was followed along the way by a number of media (probably because the mayor was involved) and here one of the cameramen is getting some footage for a group shot at the end of the cleanup. 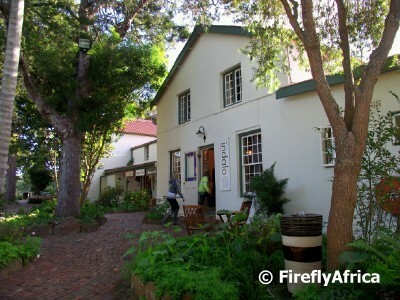 One of the landmark destinations on the Garden Route at Plettenberg Bay is the Old Nick Village, a shopping and lifestyle centre next to the N2. 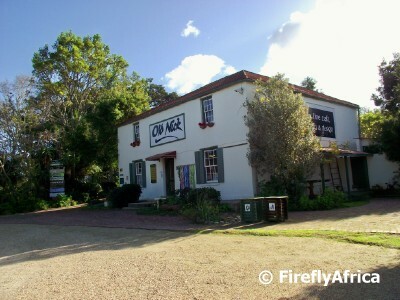 The Old Nick Shop, the main shop in the complex, is housed in the building that was originally built by Aaron Toplis in 1880 as the Gansvlei General Dealers Store. 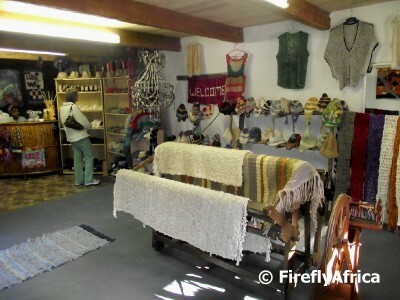 Later on a certain English-man, Spike Devine, ran an antique shop in Plettenberg Bay village, housed in the old gaol or ‘Old Nick’, in the slang of his home country. 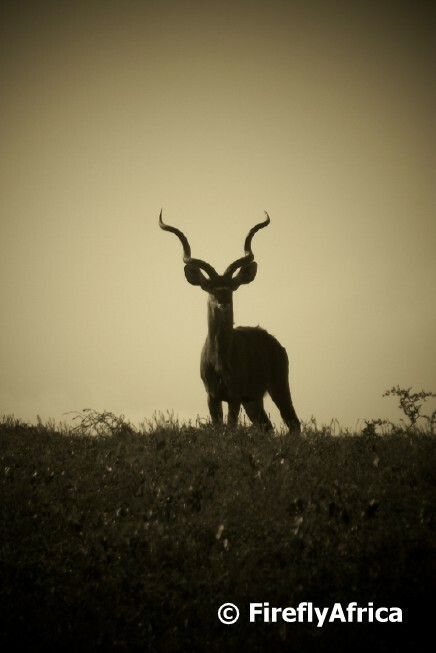 He became the new lessee of the Gansvlei shop and the site has been known as Old Nick ever since. One of the buildings also contain a weaving museum. 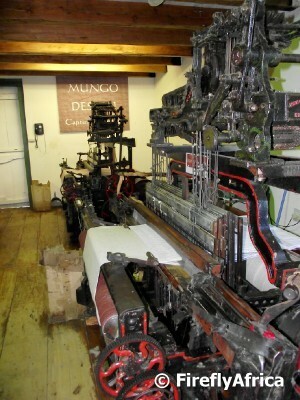 Being the only one of its kind in South Africa, this is a working museum housing 19th century power looms, sampling and producing speciality fabrics for Mungo Design, also located in the complex. The museum is open daily and there is usually somebody on hand to inform people on what they see. 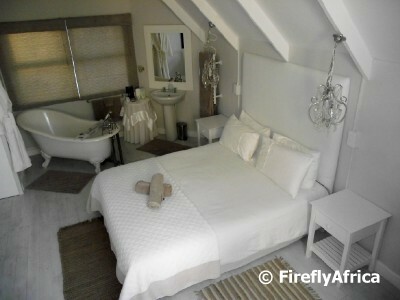 During our weekend in Plettenberg Bay we stayed at the Seabreeze B&B in the suburb of Solar Beach. 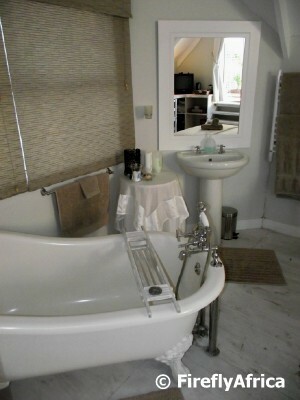 Because they weren't very busy that weekend, they gave us the honeymoon suite which was beautiful with its mostly white decor. The Damselfly specially liked the loose standing bath. 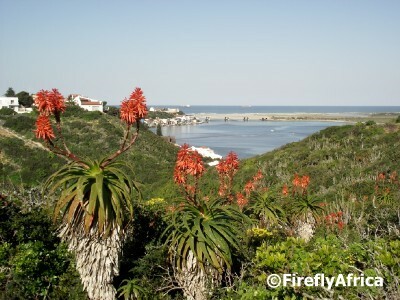 So there the Damselfly and I were in Plettenberg Bay for the weekend. It was cold, somewhat wet plus we had a couple of unfortunate hiccups during the day. For the Saturday night we had a 19:00 reservation at Kitchen Cafe in the Main Street but was seriously contemplating staying in bed with the heater on for the evening and chilling with a pizza or something. How glad am I that we didn't!! Manager Gerry met us at the front door with a very big smile and led us straight to one of the prime tables right by the fireplace. I was quite impressed specially seeing that there wasn't a lot of empty seats left in the restaurant at the time. 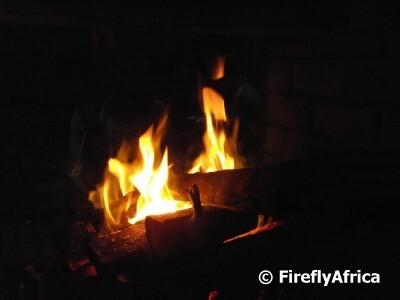 We ordered our drinks and with the fire cracking close by the feeling slowly came back in our fingers and toes. Our waiter Tyron came by with the menus and gave us a couple of recommendations. What I specially liked was how he has had just about all the items on the menu himself and could describe it all to us whenever we had a question on an item. 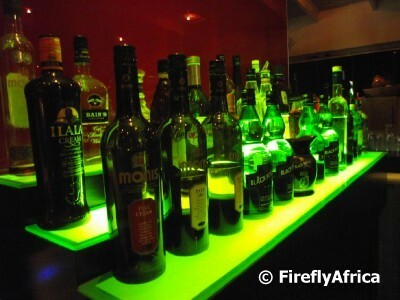 Often I find that waiters have never actually tried the items on the menus themselves and he told us that it was the owners policy that the waiters had to know the food they serve to be able to give you first hand information. 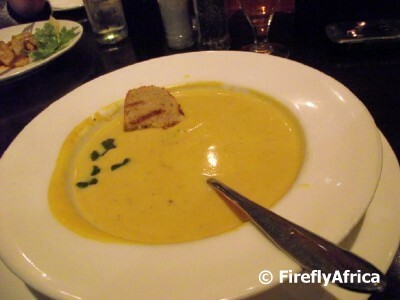 For a starter I decided on the Butternut Soup while the Damselfly had a Starter Calamari. The soup was perfect and most importantly, hot. I just hate getting a soup on my plate and its only luke warm. The Damselfly remarked how the starter calamari didn't come with the normal tartar sauce, but with a sweet chili sauce. 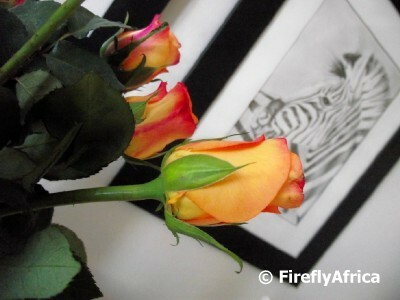 Although she found it unusual, it turned out to be the perfect compliment. 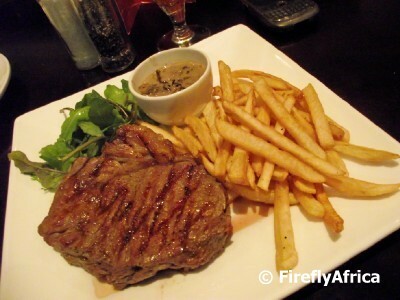 After only having a light lunch I was in the mood for some meat and the Sirloin Steak was a great call as a main. It was perfectly done and served with chips (thin, crispy on the outside and soft inside) and rocket leaves. My sauce of choice for the evening was a lip smacking port and mushroom sauce. I just couldn't wait to tuck into it and the knife just sliced through it like nothing. Perfect! The Damselfly was a bit undecided on what to have and was uhm'ing and ah'ing about possibly having the mussels. This is where Tyron stepped up to the plate (in a matter of speaking). He highly recommended the Chef's Choice for the evening. 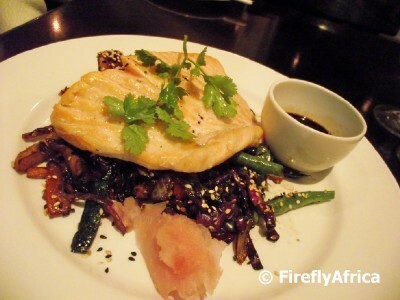 Seared Norwegian Salmon with Asian Stir Fry and Kikkoman Sauce. Believe me, she wasn't sorry that she ordered it. It wasn't just nice, she absolutely loved it. post. Rather than looking up, we are looking down. 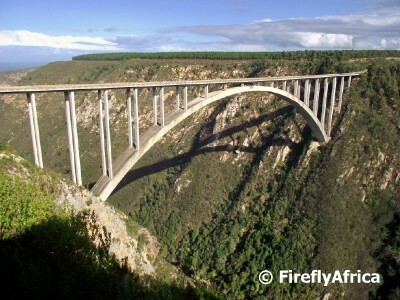 The 451m long Bloukrans River Bridge in the Tsitsikamma spans the gorge of the Bloukrans River on the boundary between the Eastern Cape and the Western Cape. Completed in 1984, the bridge forms part of the N2 highway between Port Elizabeth and Cape Town and is 216m high making it the highest single span arch bridge in the world. But all of that is probably pretty insignificant to any regular person out there. 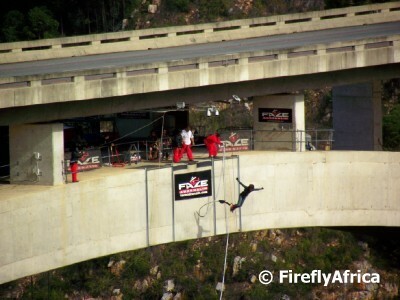 That's to say people really wouldn't have given much notice to the bridge if it wasn't also the highest commercial bridge bungy jumping site in the world. Yes, you heard me right. People pay good money to fling themselves off the bridge with nothing but an elastic cord tied to their ankles. 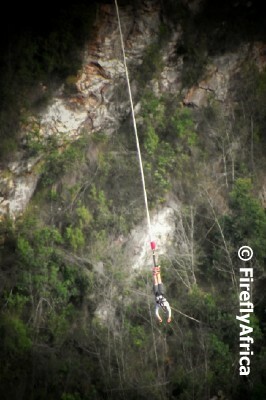 Ok, so its a bit more complicated than that, but I'm not going to go into the whole science of bungy jumping. For those who want to know more I have one word... Google. 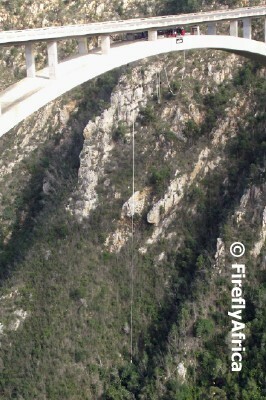 Look carefully and you will see the bungy cord hanging down below the bridge with something at the end. It kinda gives you a better perspective on high it actually is. A jumper accelerates from 0 to 100km per hour in 2 seconds and with a recoil of 140m it means that you actually get “two jumps” of over 100m. Looking closer you will notice that the something is somebody who probably by now have a massive post bungy grin on his face. Did I do it? Hell no! 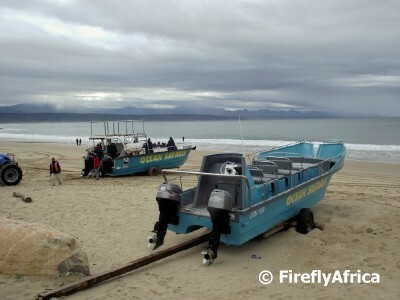 Plettenberg Bay is one after the best boat based whale watching spots on the South African coastline. We were booked for a whale watching trip while in town and I really looked forward to get a couple of whale photos to show on here. On arrival we were kitted out with life jackets and headed down to the beach to board our boat. 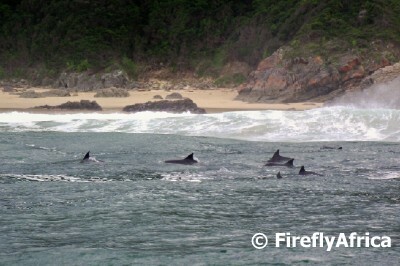 We first headed east past the Keurbooms River Mouth and found a pod of Bottlenose Dolphins near Arch Rock. The were right in the surf, so we couldn't get too close, but it was still a great sighting seeing them swimming up and down and jumping out the back of the waves. From Arch Rock we headed straight across the bay towards Robberg with the hope that we'll find the whales. 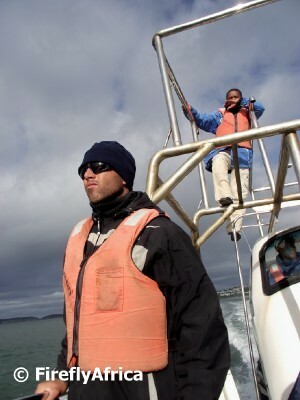 The crew kept a sharp eye out, but unfortunately we didn't find the ocean giants. We did see a couple of Common Dolphins as we were crossing the bay. Unfortunately the wind had come up and we were getting wet, so the camera was safely stowed away. 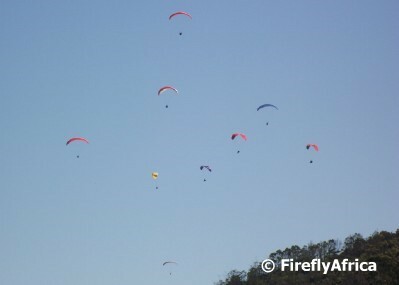 Sedgefield is a very popular paragliding destination and you can often look up from town and see a number of paragliders leisurely hanging overhead. A slow (but still adrenalin filled for first timers) sport for an official Slow Town. Looking up from the Steam Whistle Stop Cafe at Sedgefield Station this was the scene with my last visit.